Thriving communities begin with connecting the dots between the soil, the plants and our lives. 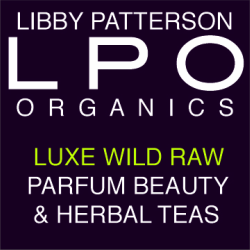 LPO Perfumes, Beauty Products & Herbal Teas are made with raw organic botanical materials that are either from a small scale farmer or wildcrafted on the Slowcoast in Central California where there is a biodiversity of pristine plants and landscape that support the mission that Libby embraces to create pure products. Quantum Neuroscience Alchemy for Intentional Living: the path of subtle scent that invokes deep memory recall, supports health, wellness, anti-aging, and inner beauty by the practice of daily routines that Libby dubbed rituals. She outlines some of the ways to use her products in her blog, highlighting her formulations, their inspirations, recipes for play, romance and restorative meditations that knit together our days and nights. Follow the blog for ideas how to layer scents, support a healthy memory, recall your vacation, take a quick mini break while working on a lengthy project, and how to mesh creative driven schedules with relaxation. Our Mission: Create a Legacy for Future Generations ::: Protect and Preserve our native aromatic botanical heritage. Enhance brain neural scent response to extend quality of life with simple organic anti aging solutions from nature. within and outside of Swanton.